The Trichoptera Recording Scheme is run by Dr Ian Wallace, based at Liverpool Museum. The scheme aims to map the distribution in England, Scotland and Wales of the 198 species, and note the habitats where they live. A complementary scheme is being set up for Ireland. Digitisation of records is proceeding apace and interim maps can be viewed on the National Biodiversity Network Gateway Website. The 175,000 records will be used to produce county checklists. The data contribute to the major initiative in deciding which British insect species deserve specific conservation effort. Caddisflies are also being investigated for the role they can play in general habitat conservation assessments. Records, particularly from still waters and small water-bodies of any type, are welcomed. Water quality monitoring of aquatic life, by statutory agencies, is much less frequent on waters of this type. If you would like to record caddisflies, or require help with identification, then please contact Dr Ian Wallace. Some of the recording initiatives. Facilitating interest in the group. Action: A Simple Key to Caddis Larvae , written by Ian Wallace is published by the Field Studies Council and available at a cost of £5. ‘A guide to the adult caddisflies or sedgeflies (Trichoptera)’, by Peter Barnard and Emma Ross, is published in Test Version with the Field Studies Council. The Riverfly Partnership initiative, ‘River invertebrate monitoring for anglers’, enables registered groups to monitor the water quality of their local rivers. 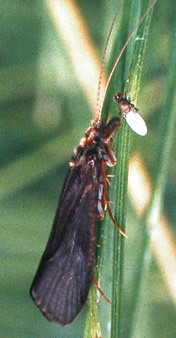 Trichoptera is recorded as a key group in the monitoring. Grannom hatches. The Grannom, Brachycentrus subnubilus, may form large adult daytime swarms over rivers. These swarms have now disappeared from some places, yet the species remains present in low numbers in larval searches. Action: Anglers are being encouraged to record where, and when, large swarms are seen to further understand this important caddis habit. Hagenella clathrata. This large day-flying caddis is the flagship for caddis conservation in Britain. Action: Recent recording effort has revealed new sites in Shropshire, Invernessshire and Surrey. Particular effort is being targeted in Surrey and Berkshire heathland where populations appear particularly threatened. Setodes punctatus. Adults were re-found on the River Severn in 2004 after a gap of 35 years. Action: To research and better understand the larval micro-habitat of the species.